VoidSpan Technologies, LLC was created in 2011 by a team of engineers, scientists, and preservation practitioners to offer unique, dependable and practical solutions to the frontier of conservation and preservation challenges. VoidSpan Pozzolan-Lime products provide high breathability and tenacious bond with low to moderate compressive strength, and our restoration grouts have the lowest water demand and the lowest shrinkage in the industry. When extended with our unique, vacuum saturated expanded shale aggregate, our gravity feed grout creates an ultra-low shrinkage, self-consolidating pozzolan-lime concrete. 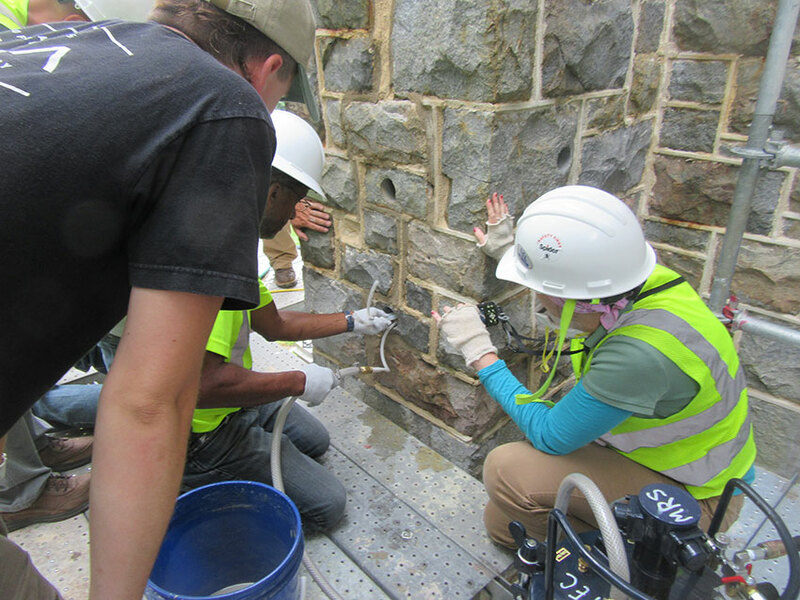 Our partnership with Cintec has resulted in the patented VoidSpan Port Anchor, which is the only product on the market that can simultaneously tie and bond separated or voided masonry back together. The Port Anchors are the only system that provide threaded inserts for the attachment of temporary clamping dunnage that allows for 3-foot (one meter) daily grout lifts. VoidSpan holds the only international patents on the Port Anchor, as well as the methods and tying and bonding existing masonry together. We are ever striving to make it as easy, safe and economical as possible to produce consistent and high-quality results in a line or work that is anything but routine. Therefore, we provide on-site training and certification, installation guidelines, a unique variety of preparation and installation tools, and pass-through sales of other products and systems that complement our own. John Wathne, VoidSpan’s founder, has been a structural engineer in the field of historic preservation for over 30 years, and has a longstanding appreciation of the need for a line of products like VoidSpan offers, having invented many of our components himself. We are excited to share our technologies with fellow practitioners and design professionals. VoidSpan Technologies, LLC is headquartered in Salem, Massachusetts, with a satellite “VoidSpan California” location in Healdsburg, CA. Grout and mortar products are produced and dry-stored in Arizona, aggregate is produced in Texas, our anchors are produced in Ontario, Canada, and our preparation and installation tools are produced and/or assembled in both Salem and Healdsburg. The majority of our raw materials are shipped domestically by rail, along with most orders that exceed 15 tons. Contact VoidSpan today to see how we can help you get the job done right.